Let's talk about Yuffie and Vincent, the optional characters in Final Fantasy VII. I decided to use Yuffie as part of my core team in this playthrough. I found her early and she's been in my party as much as possible since then. I've never used her this much before and it's interesting to see the dialog she adds to scenes. I really like her. It often feels like she's outside the main story, but in an interesting way. She has off-handed comments about the choices characters are making. Although she doesn't directly break the fourth wall I feel myself relating to her because of these asides. Her motivations aren't as complicated as the other characters, and it makes her easy to like. She doesn't have angst or conflicting memories and emotions. She wants Materia and she'll do whatever she needs to do to get it. Maybe I just like her because I'm also on the hunt for Materia and I want to collect it all! She's also the closest thing to a ninja in the FFVII universe, so that's cool. On the other hand, Vincent is a little too serious for me. He's very brooding and doesn't have a lighthearted bone in his body. His story is more directly related to the main story than Yuffie's is, so he definitely has to be more serious. I just didn't find him as enjoyable to have in my main party. He gets to wait on the sidelines. There are a few times that specific characters need to be in the party for quests. Whenever that isn't the case my main party is now Cloud, Tifa, and Yuffie. I'm probably going to keep it that way until the end of the game. I'm now sitting at 20 hours of play time and I'm on disc 2 out of 3. 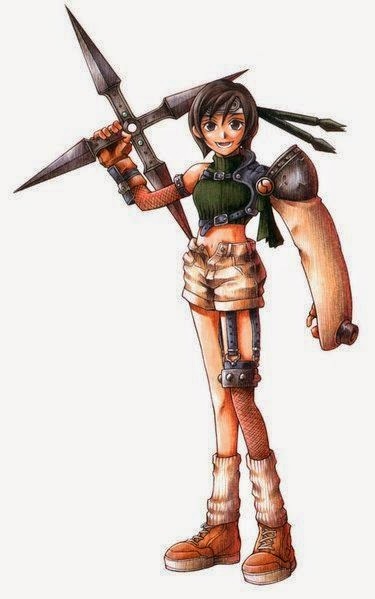 I'm not a fan of Yuffie's personality, as she's too one-note-avaricious and hyper schoolgirl for me, but she's a solid combat unit with a great ultimate weapon. 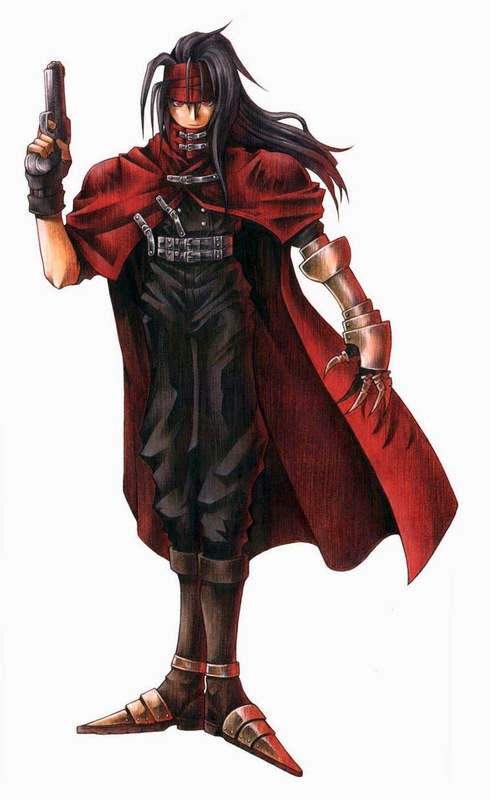 Vincent is too gothy for me to really like him, but I like his story and how he ties into Shinra's activities. His Limit Breaks are way too random for me to keep him as a mainline combat unit, though. My favorite teams are Cloud/Tifa/Red XIII or Cid. The great thing about the Materia system, though, is that I can field almost anyone and have it work out by shuffling Materia around. It really is a great bit of design, I think. It's been a lot of fun to get reacquainted with the Materia system. It really is cool. I'm glad it gives so much flexibility to team creation. I almost went with Red XIII, but Yuffie ended up appealing to me more this time. It's nice to have her in the dialog sections because it adds a light-hearted note to them. Everyone else is so serious all the time. They don't seem to have any other settings except Angry, Confused, and Determined to Save The World! I'm also finding the characters don't develop very much across the story. More information is revealed about all the characters, but they don't grow as people. I was right there with Tesh. That's the same team I'd use. I would have commented the same but he beat me to it.